The last morning came way too fast. 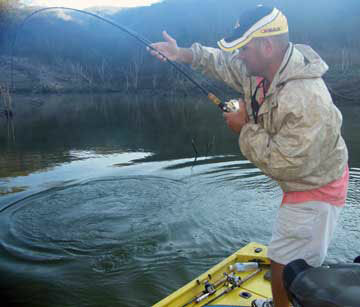 We would only fish half a day on this Saturday, and I was sharing the boat with Ron Speed Jr. We tried some different things, particularly moving from shady bank to shady bank as the sun moved in relation to the mountains to keep the topwater bite going. This morning, a Pop'R was the hot bait over the Super Spook in the backs of bays and last bluff banks. No monsters in the first few bays, but several quality bass including a mini-toad that flat out ate my one VanDam Optic Popper. You can't complain when you're popping quality bass every few minutes on a topwater plug like this solid largemouth that took Ron Speed Jr's Pop'R!! A few minutes later, another quality bass ate my one Optic Popper and broke off on a head-shaking jump... forgot to check the line for thorn tree damage... Then, as I'm snagged straight off the front of the boat while Ron throws his regular Pop'R straight off the back of the boat across a small, shallow spawning bay point when the lure disappears into a boil. 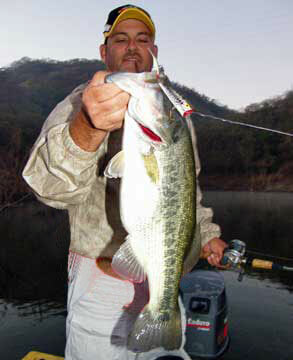 The bass immediately wraps Ron up on a laydown thorn tree.